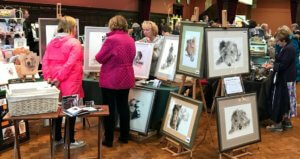 Home » News » News » Real Craft – a Success! 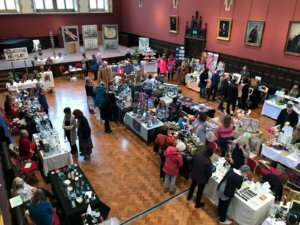 Our first Charity Real Craft Fair was held in the Grand Hall at Charterhouse School on Sunday 14th October, a year and a day after our official launch – 13th October 2017. 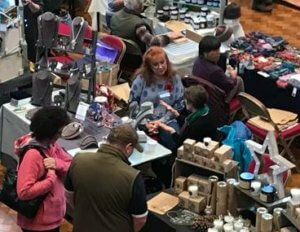 Twenty-eight stallholders displayed a wide variety of exciting hand-made work using, ceramic, glass, wood, paper, precious metals, wool, fabric and many more. Please contact us on info@storyfmr.net if you were unable to complete a feedback form and would like to comment on the day. Helpful suggestions are always welcome! A huge thanks to everyone who took part, as well as donations from friends who were unable to attend – together we raised a fantastic £2,440 for Story Funding Melanoma Research – a truly successful event for us.